The child's name and Christening date are hand detailed in platinum (silver). The venue may be added as well. A maximum of 25 letters is allowed for the child's name. 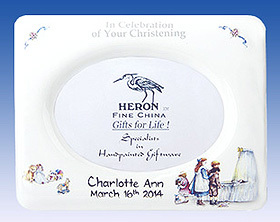 The design on this 8" diameter plate shows the new baby 's brother and sister presenting gifts. 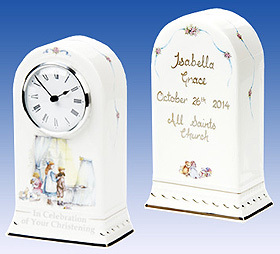 This stunning Christening Mantel Clock is 7" tall. The child's name and Christening date hand detailed in platinum (silver), on the back. The venue may be added as well. A maximum of 25 letters is allowed for the child's name. The clock also has a hand painted edge and rope motif around the base, also in platinum. The clock's Quartz movement comes supplied with a battery. "A beautiful frame to showcase that special christening day photo. The child's name and Christening date are hand detailed in platinum (silver). A maximum of 20 letters is allowed for the child's name. As with many customs, the Victorians made giving a cup to celebrate a birth, christening or communion very popular. 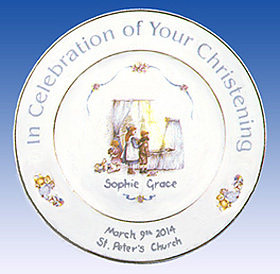 "In Celebration of Your Christening" appears inside the rim of the cup. 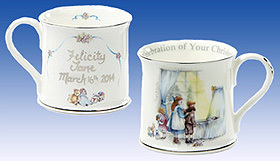 The child's name and Christening date are hand detailed in Platinum (silver) across the reverse side of the cup. A maximum of 20 letters is allowed for the child's name. The Cup is 3" in diameter and 3" high.